Peruse through the vast video archive at The New York Times, and you’ll come across plenty of your standard short documentary films, the kinds with voiceover, B-roll footage, and original interviews. But you’ll also encounter some experimental fare. There’s the fake infomercial advertising a phone hotline for racists. There’s an entire animated series geared toward parents. And then there’s the ongoing series, called Diary of a Song, which uses a mixture of low quality Skype footage and animation to walk the viewer through how a hit song was made. To listen to the interview, subscribe to The Business of Content on your favorite podcast player, or you can play the YouTube video below. If you scroll down you’ll also find a transcript of the interview. Simon Owens: Hey Nancy, thanks for joining us. Nancy Gauss: Thanks for having me. You’re the executive director for video at The New York Times. What does that job entail? That job entails essentially thinking about our video offering holistically in terms of the editorial decisions we’re making day to day, as well as the strategy we’re pursuing, and how we are maximizing our impact with the resources we have when considering creating content across the entire New York Times portfolio. Speaking of resources, can you give me a sense of how large the video staff is at The New York Times? That’s a hard question to answer, because we have a number of people who are full-time in video, but it’s hard to put an exact number because we collaborate with reporters around the building and around the world. We hire freelancers to tap into skillsets ranging from 3D modeling, to cinematography, to research and reporting. There are a number of full-time people on video, but we’re also working collaboratively with reporters in and outside the building. I was looking at your LinkedIn and it looks like you started at The New York Times before hopping to CNN for a year as a producer. What would you say is the main difference in approach between a cable news channel and what you and your colleagues are doing with digital video. For instance, with cable news, there’s a lot of talking heads, people in front of the camera discussing, opinionating, or reporting, but that kind of video doesn’t seem to do as well online. What did you notice between those two different ecosystems? When I went to CNN, I was managing a small enterprise digital team. The idea was that it was an area where we could do a lot of experimentation, both in terms of storytelling techniques but also gear and technology. Everything that team did went on TV somewhere. So it could be a 90 second segment on Don Lemon’s show, or we did several hour-long documentaries for CNN National, and I would say at that point I had worked at The New York Times and Washington Post focusing exclusively on digital, and the thing I realized is the foundation of the reporting is very similar in both realms , but the expression of that reporting is pretty different. We were tasked with thinking about what are some of the innovative, original stories we can do that had a focus on digital but also would go on TV. I was looking at it with a slightly different lens than simply straight digital to straight TV, but it was really an interesting experience, because I think it showed that a lot of the challenging work is doing original reporting and coming up with unique ideas to pursue, or different ways to frame it, and thinking about different platforms. It was really a lot of fun and didn’t require a total overhaul of the idea. I get the sense that cable news does the talking head thing because they have so many hours to fill, and you can’t create highly produced video to fill 24 hours of airtime, so they’re forced to compromise in that regard. It’s just such a different platform, thinking about a 24 hour news network vs trying to build an audience in a digital space. It’s hard to compare. I know the video team at The New York Times is creating more straight documentary news video, but you’re also producing video for the opinion side. Are those separate teams? I would say from a strategic point of view there’s a lot of collaboration and thinking about, as an organization, how are we spending our resources on video? Where are we placing our bets? Are we pursuing different editorial channels? But on a day to day level, opinion is very separated from the newsroom. We don’t collaborate in terms of story ideas or execution. But we are trying to work collaboratively to determine the kinds of videos we’re creating, the strategy that we’re pursuing, and how the newsroom, which spans news, investigations, features, and then opinions as well, are all working together to engage our audience, engage new audiences, and deliver high quality journalism. Would a producer on the opinion side not work on the straight news side? The separation is really the editorial ideation and execution. Anyone who is coming up with stories and executing them, those things are separate. But from a strategic level, thinking about where we’re going and how we’re spending our resources, there is collaboration across both sides. And then in terms of sharing administrative stuff, we have shared gear, we have a shared studio. There’s a little bit more overlap. Can you talk about the longer term, more ambitious projects you’ve worked on? What’s the process for coming out with those kinds of things? For instance, one of the things you guys got a lot of attention for was this animated parenting series that your team created. What’s the process of approaching these longer term projects? Conception was a series that was pitched by one of our really talented producers, Margaret Cheatham Williams. She developed the concept in 2016 and pitched it at a time when we were hyper focused on limited run series aligned with the features desk in the newsroom. We were thinking about ways to read a younger female audience, and she came up with this idea and pitched it. She was working within the series team. We did several call-outs where we received over 1,500 responses, which is pretty remarkable. It showed us there was a lot of demand for this kind of content. Essentially a call-out is calling out to our audience, ‘hey we’re doing this project, if you have a story to share, let us know.’ And there are various channels for them to respond and give us a sense of what they would say. She went through all those responses and looked for people who could draw out interesting stories. She interviewed a bunch of them over the phone and ended up going to interview the characters in each of those six profiles in person. She traveled to their hometown and did the audio interviews in person, and worked with a series of all-female animators, a different animator for each episode, bringing those stories to life. What is the rollout for something like that? I looked at it on the New York Times’s website, but was that published across platforms? Were you publishing them all at once? How do you generate interest in such a series? We’ve experimented with publishing once a week for six weeks and also putting them up all at once. In this case we did the latter on site and on YouTube. And then we also think about how these stories live on other platforms. But we did see over 50,000 users spent 25 minutes or more on platform per session, which is a remarkable level of engagement. We were really proud of that. I think one of the things we’ve been really focused on is serialized content and looking for ways that, when we draw people in and they find a body of work, we are seeing a lot of the binge watching behavior. So now we’re thinking about creating content and sharing it with our audience in a way that they can consume a number of episodes per visit. That’s interesting because there’s all this debate over the Netflix strategy. They really kind of pioneered the idea of releasing a series all at once. Do you look at what Netflix is doing to inform how you guys are approaching series, especially when it comes binge watching? We’re looking at what all our competitors are doing. As the platforms merge and break down, we do look at Netflix, even though the content is pretty different. We spend a lot of time looking at analytics on YouTube and experimenting with different formats, and analyzing the data to see what works. I think we learn a lot from experimenting on YouTube and analyzing all of the decisions we’re making and seeing what works. Of course we’re looking at what Netflix and other competitors are doing, and considering the moves they’re making as we’re evolving over time. But I would say we’re spending a lot of time focusing on site and on YouTube. A lot of your videos are very straightforward documentary style, but there are some that are more outside the box and experimental. 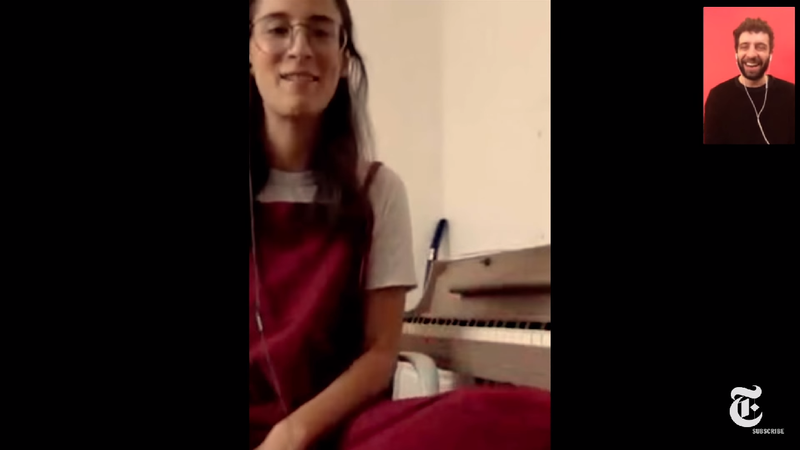 For instance, you do these really cool ‘diary of a song’ videos that are shot in this unique way where you’ll use low quality Google Hangouts interview video that has lag, which you would think would make video worse, but it somehow works really well with this style. Can you talk about that kind of experimentation and what you guys have done that’s outside the box? I think with everything we try to let the story dictate the form and really think about what is the most interesting thing about how this song is made. What are the things we can share with our audience that they wouldn’t otherwise know? The piece where we shifted that format was the middle. Between the songwriter, producers, everyone who collaborated on that, one of the interesting things we learned about that process was that the songwriter’s in Australia, the producer’s in LA, and they’ll create a song together through digital means, through their cell phones. She would send the producer a voice memo, and then they’d write back, and they’d text to each other. And they shared all those fragments with us so we could rebuild how the song went from a single line or chord and how it built and evolved into what it became. It was just a really interesting window into the creative process. We said, ‘you know, this is incredible that we are seeing how this unfolds, and we should find a way to share this with our audience in a way that’s authentic to their process.’ So we took that approach. I think it really paid off and played to the strengths of the content we had, and it’s something we’ve done a few other times. So we’re still experimenting with that series and evolving it. That was something we did to play to the strengths of the editorial framework that we had. Were you nervous about how it would come off using lower quality recordings than what you might typically see when you send a videographer directly to that person’s house and have perfect audio? Were there conversations about whether your approach would work? I wouldn’t say we were nervous. We were so excited by the raw assets they shared with us and what it revealed about the creative process that we really wanted to lean into that. And of course we don’t want to make stuff that looks cheap or sloppy, and so we definitely spend a lot of time on the first iteration of experiments like that in development and thinking about what if we do this, what if we that, and let’s consider these different approaches. And we decided that if we just talk to them like they talk to each other, I think that plays to the strength of the story we’re telling. We all thought it worked. You mentioned that it’s hard to pinpoint how many people work on the video staff because you’re constantly pulling people in. Can you talk about that collaboration with the print side, pulling in beat reporters who can either narrate or inform a video? How are you working with the traditional newspaper side of the Times? I think we’ve really evolved over time. In similar ways to both the photo department and the graphics department, all three of those departments at one point started as more of a service desk, and over time have found the right calibration for their team within the newsroom to be more of a partner. And that’s where we’ve found a lot of forward momentum. Rather than looking to the print desk for ideas or for ways we can do videos off of stories we’ve already created, we’re really trying to be more of a partner with them in developing things from the ground up that really play to the strengths of video. A good example is when we were covering Jamal Khashoggi’s murder. As that story started to unfold, there’s information hidden in corners of the open web, and if you dig deep enough, and know how to find it, you can paint a picture that can confirm or deny something that’s alleged. And we have an open source team that is relatively new and has the skillset to know how to find that stuff. In this case, our efforts really began when Turkey dropped the names of the 15 guys and the grainy photos. At that moment, we set up a Google Doc that said ‘who are these people and how close are they to the crown prince?’ And then people from all corners of the newsroom and our correspondents around the world started to work to see what can we learn, how can we confirm what’s being said, and who are these people? A lot of them were members of the intelligence community, military members, intelligence officials, so their presence online was minimal. Most of the content was in Arabic. So it was incredibly difficult to find. But we had a team of reporters across the newsroom tackling this from every angle, and we were using the open source techniques along with more traditional reporting techniques, and we were able to put together a series of dots that we could slowly connect, and it painted a clear picture that showed this wasn’t a random coincidence, it was a highly organized and planned hit job that was brazenly executed. I think that’s a really good example of the ways we collaborate. Everyone, especially on stories like that, comes together and uses a variety of skillsets to try to uncover the truth. I would say another good example of this is Internetting With Amanda Hess. That was something where we were brainstorming with the culture desk and saying, ‘what if we were thinking about these video ideas from the ground up? Where do we think there’s something interesting?’ Amanda and Alicia DeSantis were partnering with us to develop that series just for video. And that’s where I think we’ve figured out how to work differently where we’re no longer looking at print budgets and saying ‘that would make a great video, let’s make a video to go with that story.’ There are two challenges with that. One is that those ideas are often conceived for print, which doesn’t always play to the strengths of video. But it also creates a pretty redundant experience for our audience. And also the production process is so different that either the video or the article are finished before the other, and then trying to roll them out, it’s just not a fluid process. So we’ve taken a step back and brainstormed how we could we tap into the expertise around the newsroom? How can we leverage some of the ideas of people who aren’t traditional video makers, and work together to realize these ideas? And I think that’s another great of example where it’s really about working together from the brainstorm phase at the ground level. We’ve done two seasons of it so far, each with 10 episodes. It’s in line with the way she reports, but it’s Amanda decoding the culture of the internet. If you liked the format of Diary of a Song, you’ll like the format of Amanda Hess. It’s really voicey and creative and out there in terms of what you’d expect from The New York Times. That’s something we’ve been thinking about with our features desk, bringing voice into those things. I would say if you look at both Conception and Internetting, they were born in a similar phase where Conception was us thinking about the same strategy and framework but us looking through the lens of really intimate stories, trying to be creative and innovative. Amanda’s is the same but it’s hosted. So we were looking at these different models and thinking about bringing more voice and creativity in video into our work, and I think those are two good examples where the team did just that. So The Daily, the daily podcast The New York Times created, has been getting a lot of attention, and that’s built around the personality of one person, Michael Barbaro. And I’ve noticed that places like Vox are building video series around personalities. And BuzzFeed briefly had a Netflix show that was built around the reporters in the newsroom. I hadn’t seen the Amanda Hess videos, but it seemed to me looking through a lot of the New York Times videos that they are less personality driven. Is that a conscious decision that you guys don’t want to be too personality driven? I would say a small number of things we’re doing are hosted, and it’s something we’re actively experimenting with. I think when you look at the breadth of coverage we have and our focus on creating original, high impact journalism, it doesn’t always play well with a host. I’m thinking about our visual investigations work, our news coverage. Again, there are areas where we’re experimenting with it, but it’s not our core focus. We’ve done Internetting With Amanda Hess, and she’s a really good host for bringing a series like that to life. We’ve done a few videos with Max Fisher and Amanda Taub, which have been really great. We’re actively experimenting with it, but it’s not the core focus of our portfolio right now. How do you think about different native video platforms like Facebook Watch, Twitter, YouTube? Are you creating different kinds of video for each platform? Our strategy is really rooted in creating high quality journalism that’s in line with the rest of the report. We’re focused mainly on platform and on YouTube. However we do post our content on other platforms. And while we are thinking and focusing on those platforms, we want our work to find the largest possible audience, so we think deeply about strategies off platform, where to place our bet in terms of resources and how we measure success. On YouTube we think we’re reaching new audiences, there’s an additional revenue stream that comes with it, and we learn a ton about how the YouTube audience responds to our video, and we bring some of those learnings back to site and apply them to our product, creating new engagements that enhance and build out our video product. Facebook and Twitter we primarily see as platforms where we can drive audience back to site, so we’ve made a strategic decision to approach them in that way. So when we’re creating video around the editorial offering that we have on those platforms, it’s really with an eye toward driving people back to site. How does video tie in to the Times’s subscription strategy? Are those videos behind the paywall? Have you gotten a sense of how important video is to the subscription strategy? It’s something we talk about a lot. We don’t have a really granular understanding of that, but when we’re thinking about a premium subscription product that’s worth paying for that’s differentiated in the competitive landscape, video journalism is a priority for the Times, but also innovation is. Our team does a lot of work with immersive journalism and working with the graphics team to do interactives and different innovative formats that aren’t necessarily video, and so when we think about video’s role in the subscription business, it really is about creating a differentiated, unique product that’s worth paying for, and I think whether video goes behind the paywall is an ongoing discussion. What are you guys doing on the live video front? We’re doing a lot of coverage of really important, high profile news events. The Cohen hearing, Kavanaugh, stories that we think our audience is going to be looking for either while they’re at work or on the go. And they come to us, hopefully, not only to find that video, but to find the accompanying analysis that goes with it. I don’t know if you’ve watched any of the live video on our platform, but we have reporters commenting on these events as they unfold to give our audience either a richer understanding or general context so there’s a differentiated, richer experience on platform. Is that a medium that needs to mature more? It seems like very few live videos have mass viewership. I think some of the volatility on other platforms, where live is a huge priority and then it’s not, created that perception, whereas on platform, we do see really high engagement on some of these high profile events. I think when there’s a pivotal moment or something that’s high priority conversation for people, we are seeing a large audience tune in to it. I think while there may seem to be various points of views about live, we are seeing pretty high engagement when it’s the right editorial topic. The podcast about how publishers create, distribute, and monetize digital content.